Don't toss those beautiful carrot tops! Make chimichurri sauce with them instead - drizzle it on salads, sandwiches, meat or fish. Vegan, gluten free. I’m going to spare you another pesto post (although you could totally pesto these)… Today, we’re making chimichurri out of the tops of carrots. I don’t know who ever started the idea that these vibrant greens should be tossed – they’re edible and delicious so lets start using them! Wash your greens well, and chop them as finely as you can. Mix them with spices, olive oil and white wine vinegar. Roast the carrots to go along with it. Serve this with veggies, toasted bread, grilled meat, or fish… whatever you like. This recipe comes with a cute little backstory. A few years ago, Jack and I spent some time in Argentina. Upon returning home, I couldn’t find a recipe that tasted as authentic as chimichurri we had there. (Everything I tried was too parsley-ey and the spice balance just wasn’t the same). That is until, recently, we met an Argentinian friend – a coworker of Jack’s – who so kindly called his mother for her recipe. And it was, of course, just right. This is a slight spin on that recipe. I altered it just a bit to work with the carrot greens and to make it thick enough to be dip-able. (Notes about the original recipe are included below). Adapted from Fernando’s Mom’s Chimichurri recipe. Serve with roasted carrots (or other veggies), toasted bread, or over grilled fish or meat. Store in an air tight container at room temperature. It'll keep for quite awhile, but will not look as vibrant green after a few days. If this is too oily or vinegar-heavy for you, dilute it with ¼-1/2 cup of lukewarm water. Mix well and spoon it onto whatever you're serving it with, rather than dipping into it. 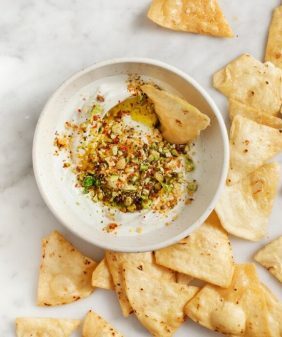 The original recipe calls for parsley instead of carrot tops, an additional ¼ cup of olive oil, ½ cup water, 1 additional clove of garlic and 1 additional teaspoon of sweet paprika. I’ve been so intrigued by chimichurri, I need to give this a try! Bravo this is really a good site ! I love chimichurri! This recipe looks perfect! yum! I love a good chimichurri, but i also love that you made it with the carrot greens! I always feel so guilty about throwing greens away. p.s. i won’t complain if all you do is post pesto. Thanks 🙂 I just love pesto so many ways, it’s endless! thank you so much for this recipe! i spent a summer abroad in buenos aires, and have not been able to track down a chimichurri recipe that lives up to my memories. i will definitely have to give this a try- the original and the carrot greens version (which is a genius twist). provecho! I love finding recipes that use the WHOLE piece of produce. I’ve always heard carrot greens are good and you can use them, just never have. 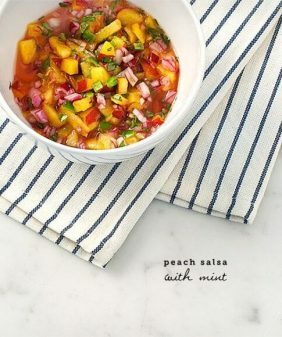 But I definitely will try this recipe – I love chimichurri and the season for grilling is coming soon and this would be great on a big plate of grilled veggies!! It is really so interesting to see all of the pestos you make with spare vegetables greens. What a cool eBook idea that could be! 😉 Chimichurri is hands-down my favorite sauce, and although I normally use cilantro, I’d be really interested to see how it tastes with these carrot greens thrown in! Ha, thanks! That would be a fun idea, for sure :). This would also be great as half cilantro (or whatever fresh herb), half carrot greens – I meant to write that note in the recipe. How long would you estimate this could keep in the fridge (if made in a quantity capable for jarring)? In the example of sundried tomatoes: I imagine since everything is being preserved in olive oil and vinegar, it would be just fine in a jar in the fridge; Would anyone agree (or disagree)? The fade in color doesn’t bother me any, the flavor and quality of the herbs will still be there. Similar to herb salad dressings, etc. Any guidance appreciated. Thank you! So clever! And pretty. I don’t get too excited about roasted carrots but I do like the sound of this spin on my beloved chimichurri. I love using the often-discarded greens from veggies, especially root veggies, but have never used the ones from carrots. I have to give this a try! Fabulous use of carrot tops! what a fantastic idea! i have a great book called ‘vegetable literacy’ and it talks all about carrot tops. will have to try this! This is such a great idea! 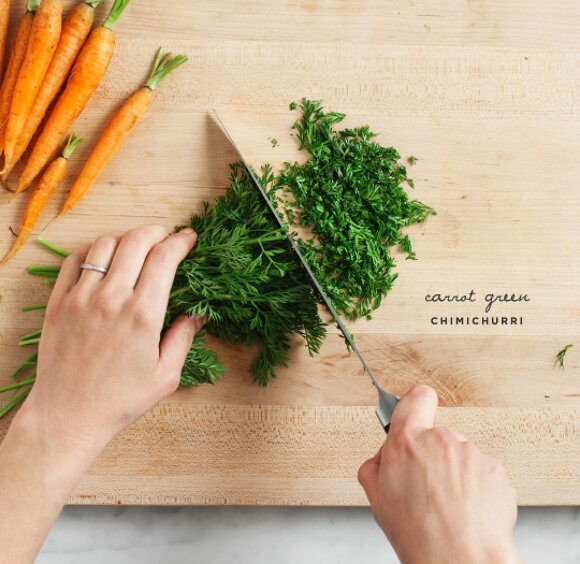 I’ve never thought about using carrot greens like this but it’s so clever and I bet it’s really tasty too! I just got into using carrot greens last summer. Love it! I really enjoy them atop pesto on sandwiches, and I bet this chimichurri would take that to the next level. Love that top photo! i have never made chimichurri before – you just inspired me..now somebody please give me a bread to dip this in. What an amazing idea? I’ve been trying to be much better about throwing away greens especially since I discovered that beet greens are amazing several months ago. Can’t wait to try this! Well tell me I am crazy and I am,, but I have been using carrots greens for Years!!!!!!! I never ever throw anything away that I can use and I use almost everything you can think of!! ha, nope, you’re the smart one – I don’t know why the rest of us (or many of us) grew up not knowing you should eat them! Brillant! I play a game with myself and then gloat when I use everything up in my refrigerator and make a yummy meal. Using carrot tops takes that to a whole new level. And, chimichurri is one of my favorites. Thanks so much! I like this recipe SO MUCH that even though I have never had chimichurri before in my life, I am going to make it one day. Do you think I can substitute carrot green with baby kale? thanks Pang :). Yep, I’ve done it with kale before – just chop it up really fine. What a great spin on chimichurri. My husband and I met in Argentina while studying abroad so all-things Argentina hold a special place in my heart. And we love chimichurri, especially with empanadas! This is fantastic! I love to use the “throw-away” bits of veggies 🙂 What a great idea! So excited to know what to do with those pesky greens. This sounds like heaven! 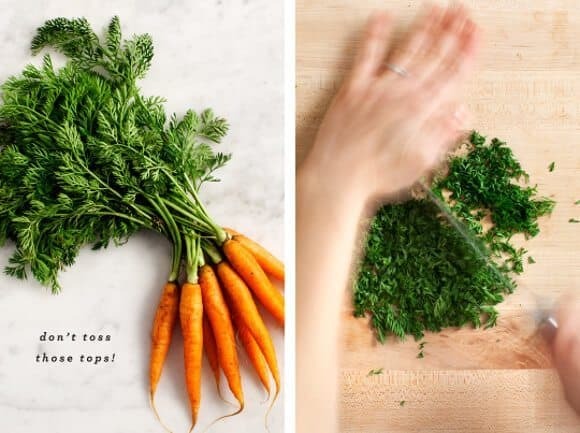 I never thought to use carrot greens – so doing this thank you so much!! Hooray! Love the chimmichurri at the amazing Argentinian-Aussie restaurant Porteño here in Sydney. Can’t wait to try this version, and thanks for the carrot tops idea– love using the whole vegetable. The thing is that I’m argentinean, and have a food blog. Well, I’m a musician and *that’*s my work. But still, I entertain myself and relax cooking, and sometimes, posting. And now, you’re throwing a chimichurri recipe! So, I just wanted to say that. Beautiful and resourceful! Love it. Can you substitute the white wine vinegar with a different kind? I used apple cider vinegar and really enjoyed the results! Golly I’ve been slinging those beautiful carrot tops into the compost all this time. Great recipe and tip. Thanks for this recipe, it was great! Had it with grilled flank steak. Tried this today and served it over grilled chicken… really great! I made it but unfortunately 1 teaspoon was way too much salt for my taste. I had to double the recipe and then eat it with yoghurt sauce, next time I’ll salt to taste again and not to measurements. I have to admit I was probably too happy trying out my first measuring set of cups and spoons, a rarity in Europe. thanks for letting me know – I’ll reduce the salt a bit in the recipe so people can add it to taste. Roasted carrots tonight and made the chimichurri to accompany and it was delicious. Thanks for sharing! Excellent!!! Love it!!!!! I served it with spaghetti using toasted baguette and it is delicious!! Loaded with K+, Ca+ and Mg a very healthy alternative to other dips/spreads. Also great on Wasa Crackers! Thank you very much for a wonderful new experience which I will revisit often! This was delicious! I really wanted to use those lush carrot tops, plus I threw in a bit of cilantro I had on hand. I served it over white fish and carrots and it was a dream. We live on a CSA and usually have far more veggies than we can reasonably eat, so usually carrot greens go to the pigs/chickens. 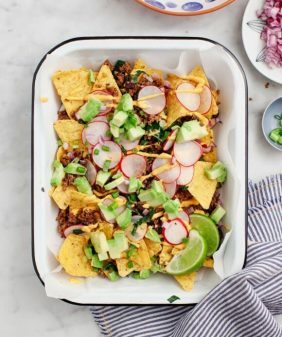 Made one batch of this today, tasted some on a tortilla chip, and then quadrupled it as a dip to feed the masses of summer volunteers at our 4th of July BBQ! Quite the hit in this veggie loving crowd, and freed up a ton of space in the fridge. My only substitution was Bragg’s apple cider vinegar, and the addition of a sprinkle of sugar to make up for the sharpness of it. Next time fresh oregano and maybe some fennel greens! This recipe was suggested by someone at the community farm -just made it and added some fennel fronds..magnificent! Will put on salmon and bake..thanks for the recipe! We ate this this evening and we tought it was suprisingly good. Great way to waste nothing and a great way to eat our homegrown carrots. Just made up a batch of this tonight! Thanks for the share! 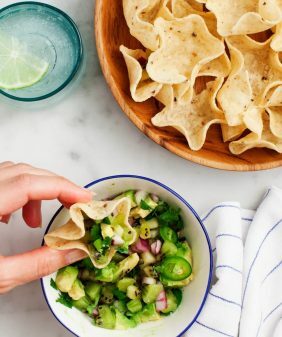 Do you think this recipe could be made with lime juice instead of the vinegar? I’m not really sure – in my opinion it’s all about the combinations of the vinegars. I’m thinking if you switched it around and made it into a green salsa, (w/ tomatillos perhaps & other ingredients) lime would go well. Today I did not have red pepper flakes therefore I used one roasted marinated red pepper mashed up and it tasted better than using the flakes! I like it much better this way and so does my husband. I’ll have to try that – it sounds delicious! As a born and raised pure bred Argentinian living in Los Angeles, I will try this chimichurri and post my opinion. YUM! I just made this, except I pulsed in the food processor. Glad to find a use besides soup stock or chicken food. I am excited to try with parsley next. A fellow CSA member pointed me here. He took huge bunches of left over greens to make this, with lots of paprika! Thanks for the great inspiration! Just made this tonight after my carrots have gone gang busters in the garden. 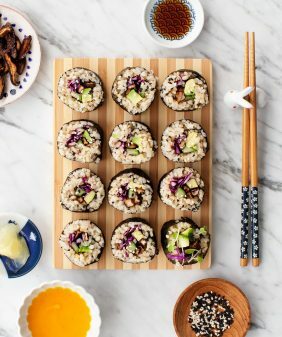 I tried this recipe with fish and it was delicious! I’d definitely recommend trying it out even if you’re not sure about it. Very tasty! Yum! But… I did not know what I was making. I was just looking for a way to use carrot tops. I had in mind to use this dish as a salad. NO! It’s much too vinegary and moist for that. We ended up wrapping spoonfuls in pieces of tortilla. Now I realize that I’ve had Chimichurri before – on bread as an appetizer at an Argentinian restaurant in Cozumel, Mexico. We loved it then, and love it now with this recipe. Thanks #loveandlemons for the recipe. I’very been using carrot greens for years, but this was a welcomed new way. I made two different batches of the chimichurri: 1 that stuck true to your recipe, and 1 that used ACV instead of white wine vinegar, add’l. 1/4 C. olive oil & 1/4 tsp. more paprika. Both were yummy, but my deviated version tasted more acidic & seemed to bring the heat out of the chilies a bit more for some reason (perhaps my white wine vinegar is too cheap or old?). Regardless it was a winner. this is a delicious recipe ! the only chnage i made was to use 4 garlic cloves. i will never roast and eat carrots differently than this way 😀 last time i made the chimchurri, i forgot to use it for 10 months !! i threw it away as i was not sure if it was safe to use, even though it was in fridge. thank you for sharing this recipe. This is one of my favorite recipes! I make it many times each fall when I harvest carrots from the garden. I’m so so happy to hear that!! I dried my greens and garlic and then make fresh/add the liquids when needed. The color is vibrant and tastes like summer. I usually mix it a few hours (to overnight) ahead of time to let the flavors marry before I need it. Deliscious. Thanks for the recipe. I’m glad you loved the recipe! Perfect … making it tonight … my friend was visiting from Argentina recently and she whipped up a chimichurri with just what was in my cupboard … it was such an organic process for her and it was delicious! Thanks for the carrot top version! Just made this and used red wine vinegar too and loved it! I also mixed in some cilantro I needed to use up with the carrot greens – so yum! This is delicious!! I am going to have it on top of a nomster (nom nom paleo) burger for dinner tonight! Thanks for the excellent recipe — I found it while looking for interesting things to do with my carrot tops. Tossed this with some sheet pan roast beets and chicken thighs and it was fantastic! 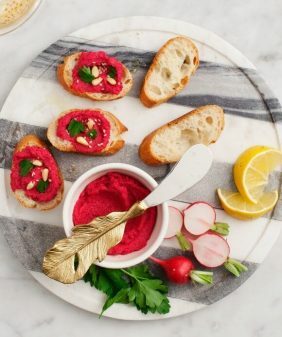 Really good with the sweetness of the beets. I’m going to keep this recipe around for the rest of roast vegetable season and on into BBQ season. I’m so glad you loved it and that it’s so versatile! Made this tonight as I had a huuuge bunch of carrot greens hanging around (and still have more!). Was super quick and easy and a really tasty addition to some lentil and cauliflower tacos! ooh, I LOVE the idea of using the chimichurri over lentil and cauliflower tacos – yum! Adding that to my to-make list.